Know the realities of your athlete’s potential, as well as know the facts about high school athletes who go on to play a sport at the collegiate level. We’ll give you a hint – it’s less than 3%. Remember that they are playing for them and for others – not just you. Learn from the experiences of people who have managed a sport well. They must have done something right in order to have success! Although these rules are not rocket science, we all need encouragement and reminders when discovering how to build a winning team and develop successful people on and off the field. Rule #4: Know How Hard to Push. While we all know the importance of building healthy competitive habits in our athletes, we can still lose sight of what that looks like fast. Some parents have fallen into the rut of spending so much money on their child’s sport over the years in an effort to gain a competitive edge that they miss the fact that their athlete has a dwindling desire to continue to play the sport. The financial investment into a sport over a long period of time does not always equate to a long-term investment in life skills for your athlete or even more passion from your athlete. Parents are spending a lot of money on equipment, team fees and more, and they are losing sight of whether those finances are actually fueling something that is still the apple of their child’s eye. According to the National Collegiate Athletic Association (NCAA), the average NCAA athletic scholarship for football and basketball is nowhere near the full ride, amounting to approximately $8,707. In sports like baseball or track and field, the number is routinely as low as $2,000. Tuition and room and board for NCAA institutions often cost between $20,000 and $50,000 a year. Some collegiate level sports are head count sports where the few scholarships that are given cannot be split up – that is to say, an athlete is either in the minority that gets offered a full ride, or they receive no scholarship at all. Athletes experience stress from all angles: the sport’s expectations, parents, future programs, coaches, peers, competition themselves, etc. This level of demand is only good on an athlete if it’s properly managed. How do guys like Stanley take the things they’ve learned from coaching winning teams to refocusing players and families back on building necessary life skills? What a sport teaches an athlete in life is far more valuable than what it teaches about difficult parents and coaches, high expectations that are not based in realities, and doing a sport for the wrong reasons. The best way, according to Stanley, is to model what it looks like. “All teams have a defining culture. I want my players recognized by their brand of play. Before I even meet my team, I consciously revisit my value system to take inventory of what I stand for as a role model and what universal virtues I believe will best serve my players in life. If you don’t go through this process, you’ll lose the team before you know what hit you. Identify your values and then coach to those values. I coach the way I want my players to play; I try to model hustle, grit, crispness, preparedness, a calm temperament, confidence, and I hope it catches on,” Reed said. 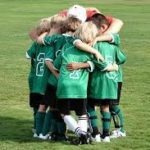 Working in youth sports, your focus will probably be somewhere between modeling a good example and going out of your way to ensure the team is having fun. If someone or something can help with that goal, then use it! Start by asking those who are managing successful teams and have a proven track record in developing incredible athletes and incredible people. In sports, if you want to manage your team correctly, do what the elite and collegiate national championship programs do. As a general rule of thumb, we should copy the people who are doing it right. This goes for coaches and parents as well as athletes and everyone in between. New volunteer coaches can seek mentors who have coached longer. Middle school programs can partner with high school programs. A second grade baseball player can have a big buddy college level baseball player as a role model. You get the picture. Another easy way to get help is to hand off the work to technology. In our world of preferred mobile communications and the Internet, parents will have all the tools right in their hands to get involved and have a positive impact on their child’s team sports online. Remember, these are just ground rules. The satisfaction of knowing you helped to bring a positive impact into an athlete’s life will have you soaring way above these ground level rules.